NEWPORT, RI, April 2007 –- To meet a growing demand for villas on St. Barts, Wimco, the leading marketer of exclusive and sophisticated villa rentals in sun-splashed places, has added five villas to its available-only-through Wimco inventory. St Barts is increasingly popular because of its quaint French culture, family-friendly environment, uncrowded beaches, fine cuisine and world class shopping. The sophistication and amenities in these villas will make them very attractive to today's discerning traveler. 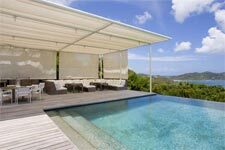 For the upcoming season, Wimco represents 265 St. Barts villas, most of them on an exclusive basis. Wimco's villas range from 1 bedroom retreats starting at $3,000/week in peak season to six bedroom compounds costing up to $40,000 a week in peak season. 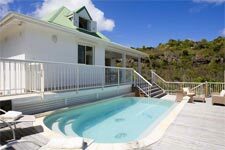 Poised to become a new crown jewel is the brand new, highly private 4-bedroom Villa SIB CJB on a hill in the Colombier neighborhood with a view of Gustavia Harbor. This contemporary villa, designed by renowned local architect Olivier Dain, is embellished with an eclectic mix of oriental antiques, sculptures and modern art. Among its attributes are a gourmet kitchen, a media room and a large lap pool with two jacuzzis. The weekly rate is $40,000 except Dec.15- Jan. 4 when it's $50,000. Also brand new and highly affordable is the 3-bedroom Villa SIB PAY in Vitet, with all rooms under the same roof making it the perfect family house. There are a spacious master suite and two smaller bedrooms off the living room. For maximum togetherness, the well-equipped kitchen shares space with the living room. Dining is on the terrace. Weekly seasonal rates range from $3,900 to $7,900. 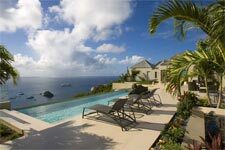 Another 4-bedroom gem is Villa SIB BOW in Camaruche with views of St Jean and beyond to St Martin. Private terraces access three private guest cottages and a luxurious master suite near the vast infinity pool off of the main living area, open gourmet kitchen and lanai. The weekly rate is $25,000 April 15- Dec. 14 and $40,000 Jan. 5-April 14. A newly renovated 3-bedroom Villa SIB VNS in Petite Saline overlooks Lorient Bay and surrounding islands. A fourth accommodation is available (at an extra charge) in an on-property cottage. The equally sized bedrooms all open to an ocean view as does the chef’s kitchen with al fresco dining area that seats six. A spacious deck surrounds an infinity pool. Weekly seasonal rates range from $25,000 to $45,000. Villa SIB AND offers 3 bedrooms on a hillside overlooking the water at Flamands. The comfortable living room opens onto outdoor living and dining areas near the pool and sun deck. The king and queen bedrooms also overlook the water. Guests enjoy sharing the chopping in an open kitchen. This region has easy access to beach, bakery and shops. Weekly seasonal rates range from $3,940 to $8,400. Through Wimco's partner SiBarth, villa guests alike can enjoy a wide range of concierge services: private chefs, provisioning the villas, babysitters, French lessons, massages and more. In addition to air and car reservation services, guests can also enjoy a new inter-island service that whisks them direct from San Juan Airport to St. Barts, bypassing time-consuming transfers. 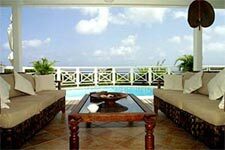 Wimco is the leading marketer of exclusive and sophisticated villa rentals in the Caribbean and Europe. For over 23 years, the Company has been sending clients to its portfolio of private villas and distinctive hotels in St. Barts, St. Martin, Barbados, Italy, France, Mykonos and many other desirable vacation destinations. Fortune Magazine recently rated Wimco amongst the top 5 villa specialists in the world as the result of its strict selection standards for high quality properties, the largest exclusive portfolio of properties in the Caribbean and Europe and its award winning client service. Forbes Magazine recently rated Wimco's online villa rental service "Best of the Web".